An article posted on USA Today’s website today shows some surprising poll results. Among them: those people polled who were likely to cast a ballot in November were more likely to vote for Mr. McCain, by a 49% to 45% margin. 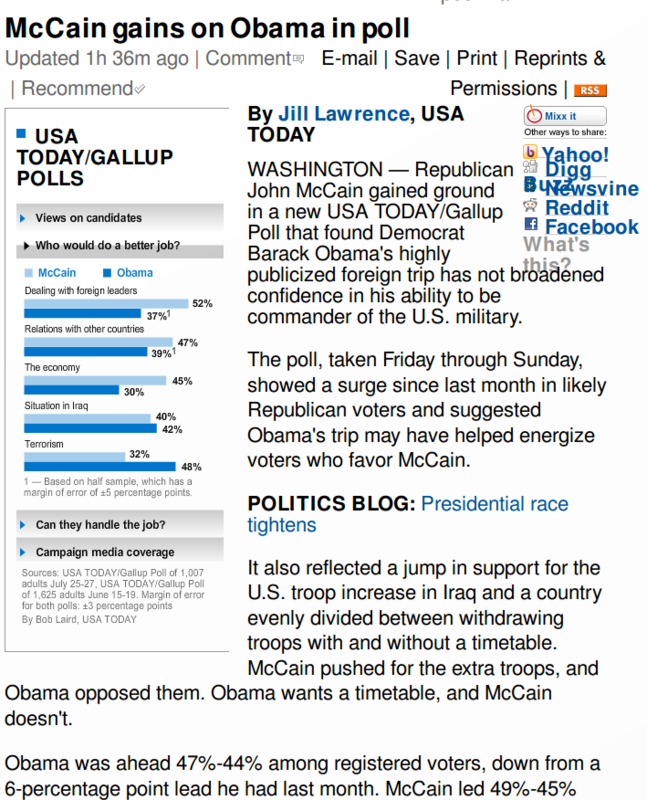 Among registered voters, however, it was Mr. Obama in the lead, enjoying the support of 47% of respondents vs. Mr. McCain’s 44%. The graph shows respondents picked Mr. McCain by a 52% to 37% margin (with a footnote indicating Mr. Obama’s result was “Based on a half sample, which has a margin of error of +/- 5 percentage points.” (No reason is given as to why a “half sample” was used in Mr. Obama’s case). 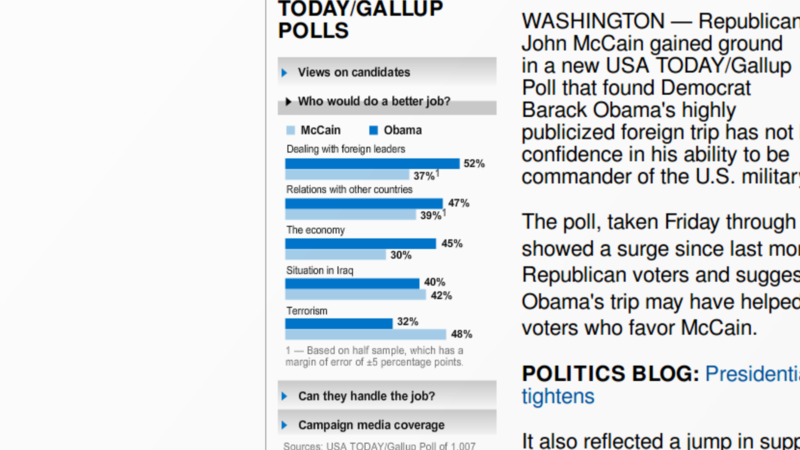 Again, the graph for Mr. McCain shows a majority support him in this context, this time by a 47% to 39% margin (once again with the “half sample” footnote for Mr. Obama). Majorities in the new poll said Obama would do a better job than McCain in dealing with foreign leaders and handling relations with other countries. 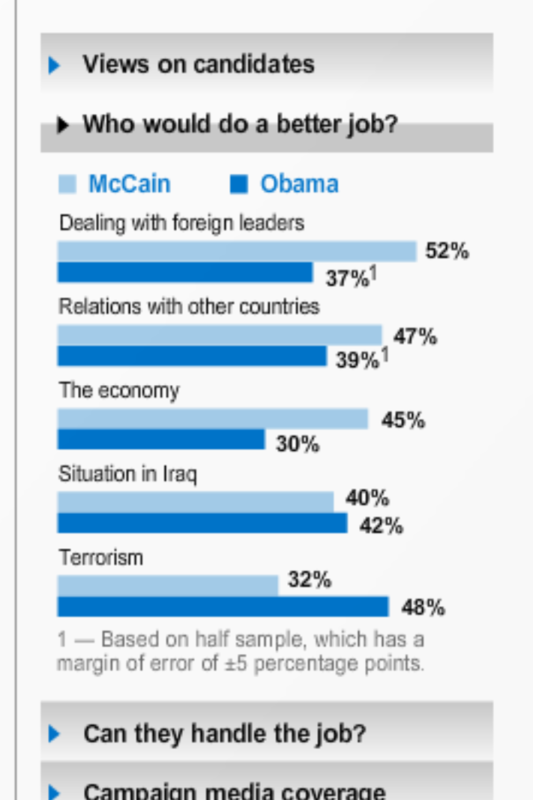 The graphs for this one show Mr. Obama trouncing Mr. McCain 48% to 32%, which doesn’t seem right on the face of it – Mr. McCain, after all, long ago adopted the persona of “War Hero” and “Military Man”, and Mr. Obama is hardly seen as the “Anti-Terrorism Candidate”. Stay tuned – we’ll update this post upon USA Today’s reply to our email or their correction of the article.